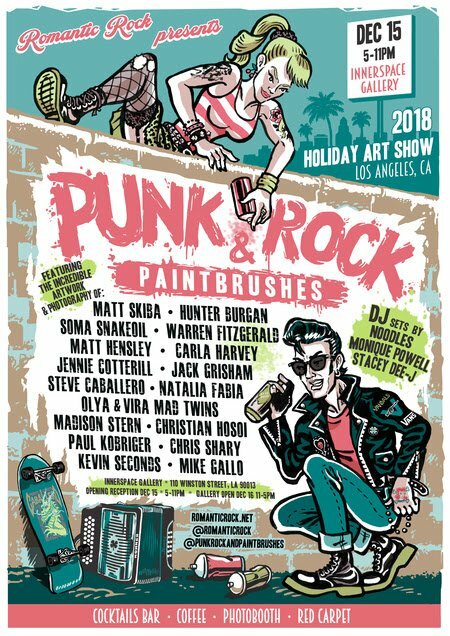 Funds donated from the Punk Rock & Painbrushes Holiday Art Show will go directly to the streets and also assist with providing the art mural to Skid Row the very next day, working with houseless artists and the community at the “Holiday Sidewalk Party.” Punk Rock & Paintbrushes will also be raffling off a collaborative art piece created by PRPB artists, with all profits to benefit The Sidewalk Project. More information on the “Holiday Sidewalk Party” on December 16 can be found at: www.instagram.com/The_Sidewalk_Project The Innerspace Gallery is located in downtown Los Angeles at 110 Winston Street, Los Angeles, CA 90013. 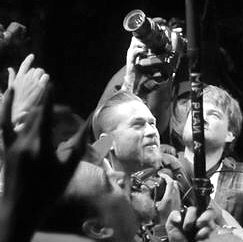 The Punk Rock & Paintbrushes group art exhibition will also be open on Sunday, December 16 from 11:00 a.m. – 6:00 p.m.